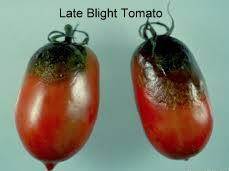 Late blight on Tomatoes and Potatoes. Is there a Cure? Late blight spreads like a wildfire. This fungus produces spores in abundance and with the help of moist wind they will travel up to 30 miles. 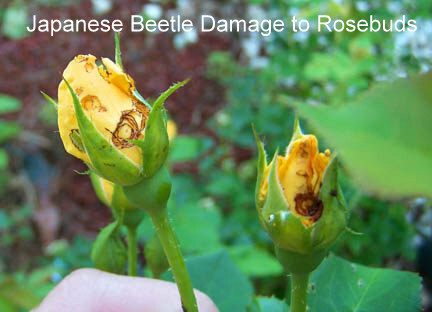 It is imperative to destroy infected plants as soon as possible as this disease is easily spread. This disease shows up in late summer as the hot and warm humid days may be followed by cool and moist nights with accompanying rain, fog and heavy dew. This is a indicator to the home gardener to become watchful for the signs of late blight. Leaves will develop water soaked spots. The spots will enlarge and quickly turn from brown to purple to black. Shoots of the plant will turn black and eventually the plant will collapse. As the plant rots there is a foul odor; a whitish mold may be present. Tomatoes will show grayish water soaked spots, enlarge and turn dark. They may have additional rot, an unpleasant foul odor and be mushy. Potato tubers will show purplish or brown corky spots. There may be additional rot, an unpleasant foul odor and be mushy. Check your potatoes and tomatoes daily following cool, humid and prolonged wet weather followed by warm/hot humid days. 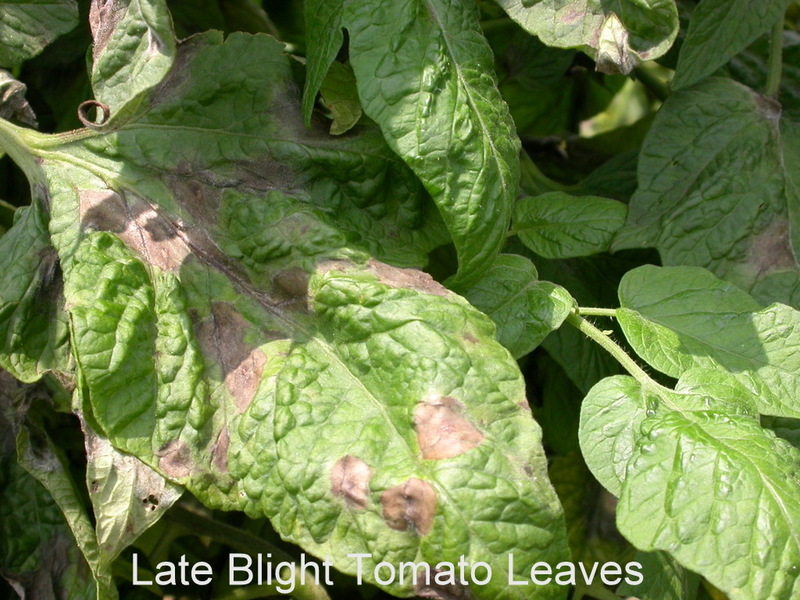 Sign up to receive alerts (www.usablight.org) for immediate notification when late blight is confirmed near you. Copper fungicides (Elemental copper as cupric oxide) can be highly effective if applied as a preventative (before infection) and with complete coverage of all plant foliar surfaces, including the undersides of leaves where the fungus typically produces spores. Follow the label and use as prescribed. Neem oil is an alternative fungicide. Follow the label and use as prescribed. If symptoms are found remove the plant(s) immediately in plastic sealed bags. Remove the plant(s) when the leaves have dried to decrease the dispersal of spores. Dispose of this diseased material in plastic sealed bags with your household trash. Burning the diseased plant material is equally effective. Change your clothing and wash your hands/change your gloves before entering the garden again. (Spores from late blight could be reintroduced from your clothes, hands and gloves) Remember this is a highly contagious disease. Hill your potato plants to stop spores from draining down to the tubers. Some gardeners will cover their tomatoes with an old tent frame or swing set and place plastic over the frame. The frame must be higher than the planting and permit air movement as there cannot be condensation on the leaves. High tunnels have been very successful. 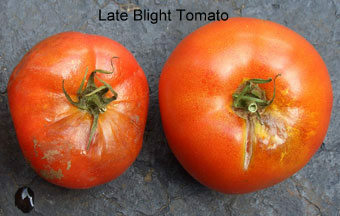 Are there blight resistant tomatoes? 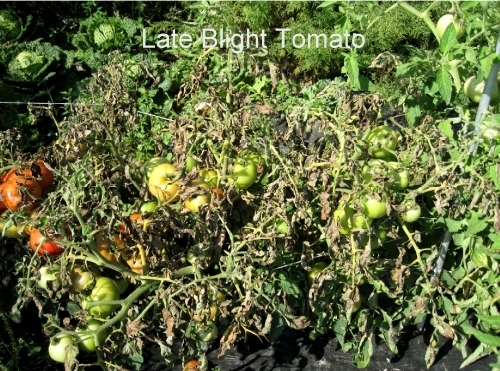 An article in growveg.com (January 17, 2014) by Barbara Pleasant offers a list of 9 blight resistant tomato varieties offering excellent to very good resistance. 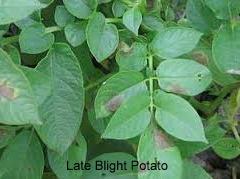 Are there blight resistant potatoes? If there are symptoms as harvest approaches remove all potato foliage from the garden and wait 2 weeks before digging the tubers. Wait for dry conditions to dig your potatoes. Check your harvested potatoes for spots and cull if spots are present. Do not store spotted (culled) potatoes with unaffected potatoes. Any fruit that rot after picking should be put in a trash bag and disposed with household garbage. Unaffected parts of fruit can be consumed, but fruit from affected plants should not be canned due to concern that the pH may not be sufficiently low. Tomato seed is not a carrier of this disease. Cleaning the garden of all living debris, tomatoes and potatoes is essential. Burn or bag this debris for disposal. Do not compost. Again, this is a very contagious disease. 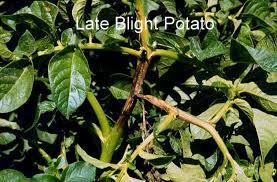 Late blight has been with us a long time. 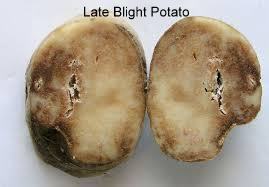 The potato famine in Ireland of 1845 was caused by late blight. As you have read this disease is highly contagious and your daily observations are necessary to spot the symptoms and act accordingly. Floating Row Covers? Let’s Learn How! I just uploaded a new video documenting how to make and install floating row covers. Low tunnels using floating row covers is of great benefit for several reasons. Floating row cover is a light weight, breathable fabric that allows air, moisture and sunlight to pass through the material. There are various fabric weights to meet different needs. Agribon 15 is lightweight fabric that is used for insect protection and shading. Insect protection – when properly sealed, insects cannot penetrate the covering which protects the crop from damage and disease. Problem insects such as Japanese beetle, squash bugs, squash vine borer, cucumber beetles and flea beetles are blocked from doing their usual mayhem. Isolation chambers – Low tunnels are ideal for seed saving of crops such as squash, pumpkin, melons and watermelons. Bumble bee hives may be inserted at one end of the enclosure to insure proper pollination. Plus, there is not a chance of cross pollination. You may grow several varieties side by side. That is a huge advantage. Season extension – row covers placed over a crop will allow for early planting by trapping 2° – 8° (F) higher temperature. Likewise using a row cover late in the season will protect the crop from early frost. By using this method you can easily extend your growing season by one month!!!! Hoop houses, high tunnels and greenhouses – row cover gives added protection and benefits the grower with lower fuel costs. The insulatory value of the row cover will block some of radiant cold that may damage a crop. This is another method and tool for your gardening arsenal!!! These beautiful creatures have metallic green bodies with copper colored wings. They are 3/8 inch long and 1/4 inch wide. Japanese beetles are quite unique! It is amazing the damage these imported invaders can do! This is damage from one or two beetles. Imagine what a few dozen can do! 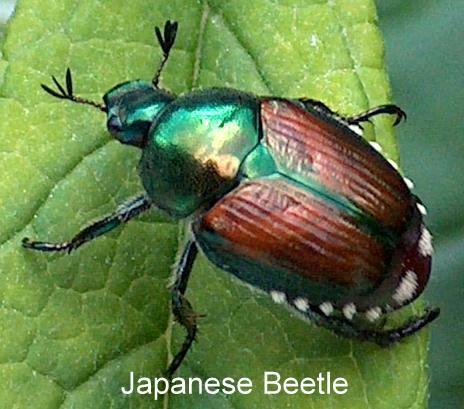 Japanese Beetles (Popillia japonica Newman, 1841) came to our shores in 1912 on Japanese iris. Adult beetle emerge from soil May through June. It is a voracious eater for 30 to 50 days. Once emerged it searches for food sources. 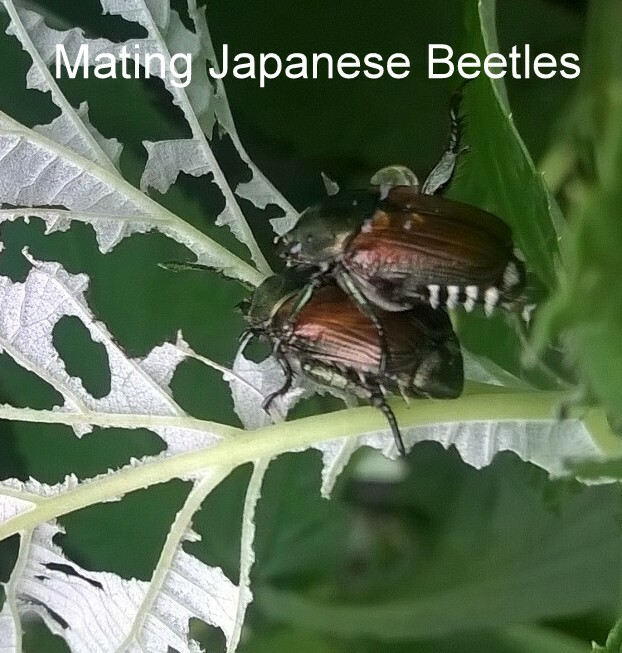 A pheromone (a scent produced by Japanese beetles to attract other Japanese beetles) is sent out to help other Japanese beetles find the food source. Mating is soon to occur. Females feed for a few days on a plant food source and burrow 3 inches into the soil to lay eggs. Once the eggs are laid the females emerge again to feed, mate and lay eggs again. This cycle is repeated until their season is over, laying upwards to 40 to 60 eggs. Eggs develop depending on soil temperature. The warmer the soil the quicker larval development. Once they are larvae, they move upwards in the soil to feed on organic matter and roots. Soil cooling moves the larvae (grubs) deeper in the soil for winter. Soil warming moves the grubs upwards in the soil where they pupate and transform into an adult Japanese beetles and their life cycle begins again. The most effective natural control of Japanese beetles is daily, hand picking early in the morning as the beetles are lethargic. Your arsenal of weaponry includes a bucket, soapy water and vigilant monitoring daily! Early detection of the scout Japanese beetles is key to this strategy! This will reduce the following years population!!! Place the bucket under the infested plant. Shake the plant and the beetles will fall into the soapy water. Hand pick any beetles not falling into the bucket of soapy water. This action reduces the pheremones of the exploratory first wave of Japanese beetles. This must be done daily!! 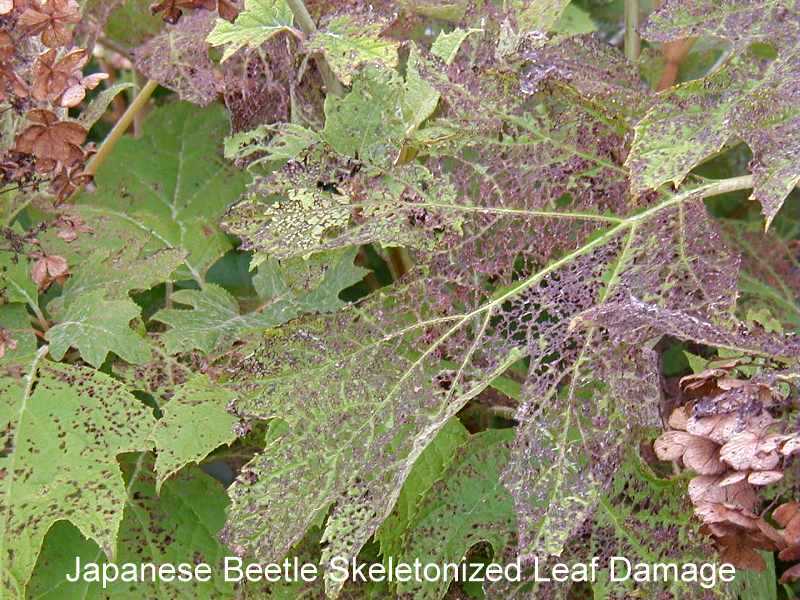 Place the bucket(s) near areas of previous Japanese beetle attack. Insecticidal soap applied directly to the beetle will cause its demise. Lemon dish soap sprayed directly on the beetle is another effective way to kill these pests! 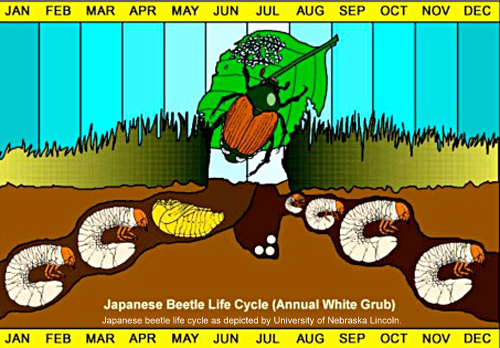 Prevention: Kill grubs in the soil which turn into the Japanese beetle. Milky Spore Disease (Bacillus popillae) will kill grubs but will take up to a year to inoculate the soil. This inoculation will last up to 10 years in the areas of heavy, consistent infestations. Milky Spore when ingested in the grubs gut germinate, enter the blood and multiply. The build up of spores causes the grub to have a milky white appearance. Grubs continue to ingest the spore, become infected and die, each releasing 1 – 2 billion spores back into the soil. Apply as labeled. May be purchased through biological mail order catalogs. Beneficial nematodes actively seek out grubs in the soil. The nematodes penetrate the grub releasing a bacteria. This bacteria produces quickly feeding on the tissue of the grub. The nematodes feed on the bacteria and continues their life cycle. They reproduce, release bacteria and kill the grubs. 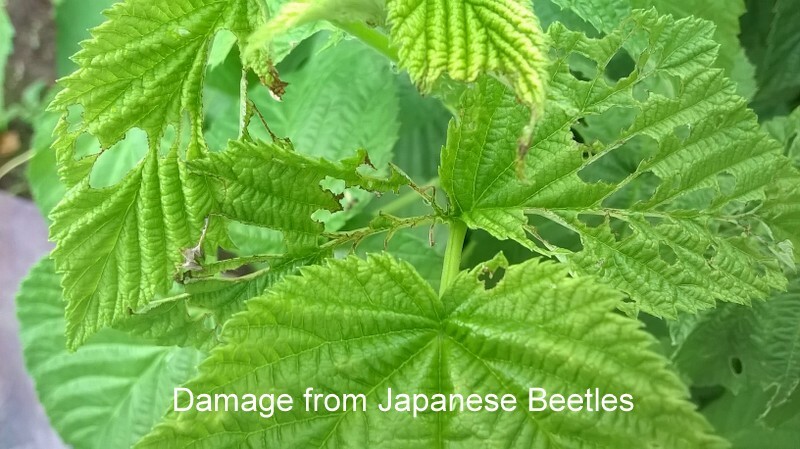 Both of the above methods are encouraged by the USDA and several well known universities as a safe and effective means to control Japanese beetles. These biological controls are species specific!! There are no other creatures affected by these methods. Just remember you may have great prevention measures but your neighbors may not. Japanese beetles are with us for short 30 -50 day window. Killing them early may reduce the populations in your immediate area! Birds are another way to deal with these nasty pests. They eat both the beetles and their grubs. Sanitation is a wonderful way to rid your self of these pests. Clean up all debris around their favored plants. Till in the fall to expose the grubs for birds and other creatures to consume. Till again in the spring to again expose the pupae and emerging adult beetles. Be diligent and decrease their surplus population! Got Mosquitoes? Use Bacillus thuringiensis sub. israelensis (Bti) and Cedar Oil!! Now is the time for those pesky mosquitoes. I don’t want to use all those nasty chemicals. There has got to be an alternative! Remove all sources of standing water, where possible. Keep grassy and/or weedy areas mowed on a regular basis. 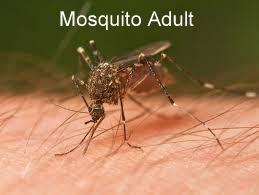 Mosquitoes will reproduce in high humidity areas! Mosquitoes will lay eggs in wet soil and mud! Use Bacillus thuringiensis sub. israelensis (Bti) (OMRI Listed)* in standing water. 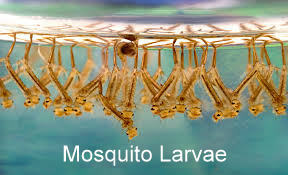 When eaten by mosquito larvae, Bti is toxic to the point of death in 4 – 24 hours. The gut of the larvae ruptures from the formation of crystals produced by the bacteria. Bti is dispensed in the form of crumbles, powder or doughnut shaped dunks. Bti is placed in old tires, rain barrels, ponds, ditches and flood water. Bti is non toxic to people, pets, livestock and beneficial insects. It is only toxic to certain larvae of the fly family (Diptera). Cedar oil (OMRI Listed)* is a safe, effective product to spray. This essential oil (mixed with water) may be sprayed on standing water sources. May be sprayed on your dogs and cats. These products may be purchased at the big box stores, garden centers and online. * OMRI Listed: The Organic Materials Review Institute (OMRI) is a national nonprofit organization that determines which input products are allowed for use in organic production and processing. OMRI Listed—or approved—products may be used on operations that are certified organic under the USDA National Organic Program.